This is just one of the many under layers. This layer is probably the mot important of the bunch. 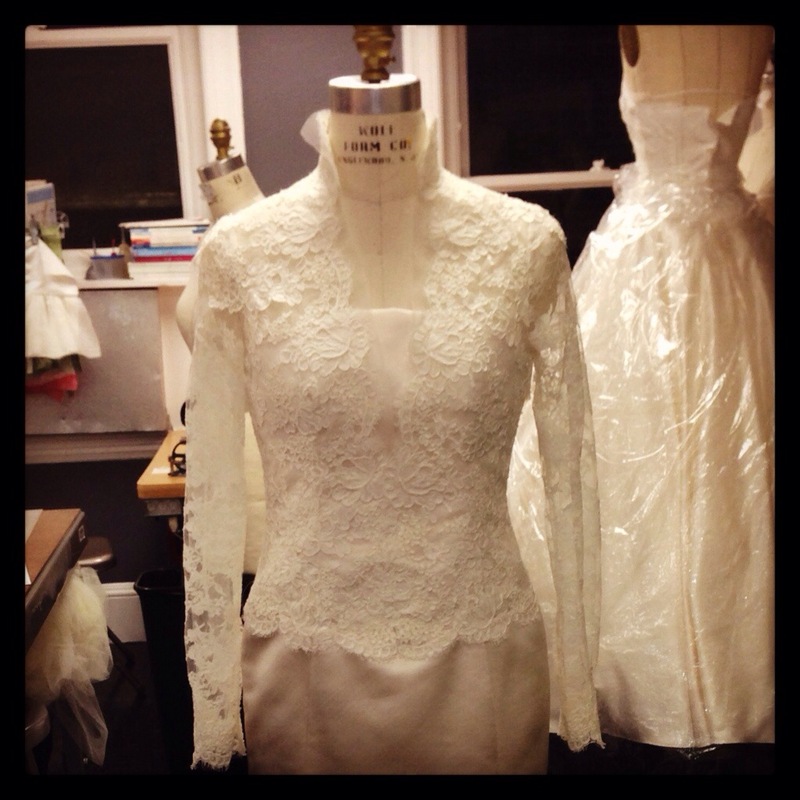 This layer is made up of a light layer of interfacing and plastic boning. I placed strips of boning on each of my seams, and a diagonal bone acting like a suspension bridge from side seam to princess seam. This: adding more support where it is needed. 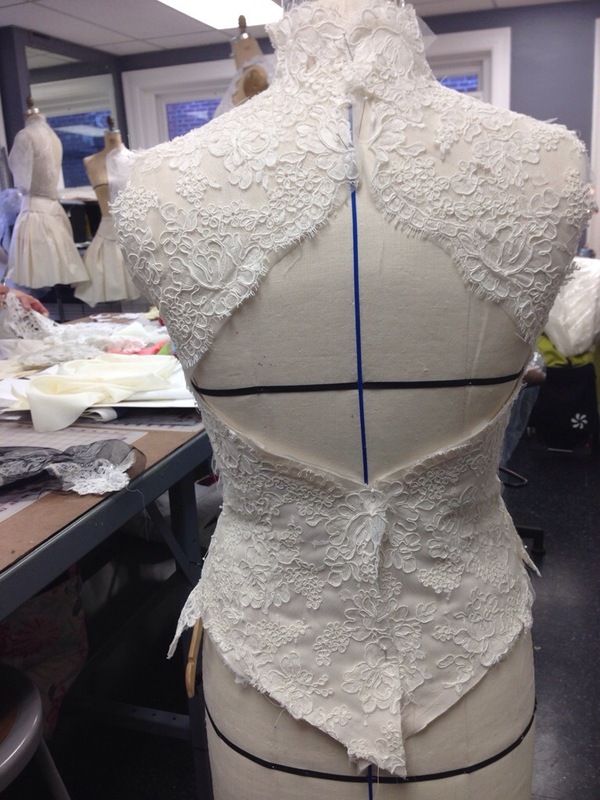 This boning helps the dress and its wearer hold her shape. With bones strategically placed, any wearer can look like a million bucks! Ever heard of a corset? Ya, that’s basically what this is….just custom made. 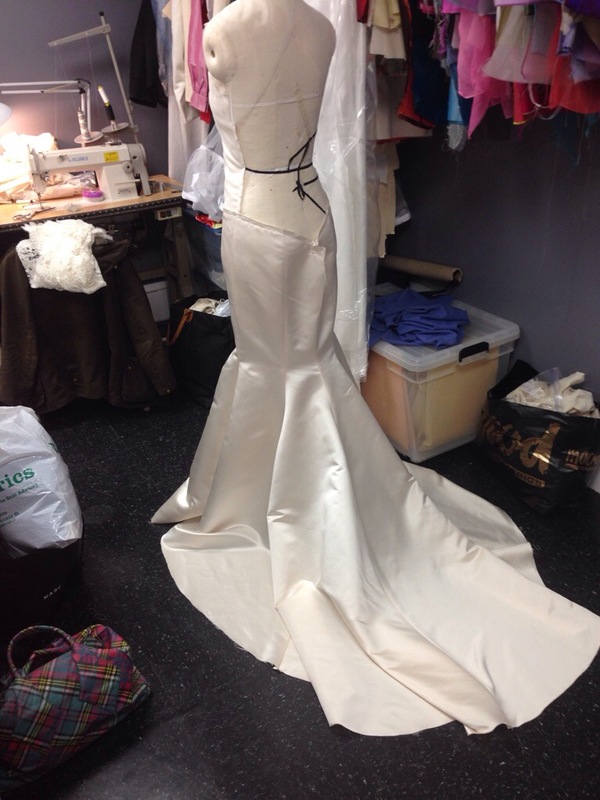 The Main body skirt. This is made up of the fashion fabric in this case, satin. Train lining. A thin layer of Hang loose lining that will line and clean finish the fashion fabric above. The next three layers are cut from a different pattern piece. These layers exclude the train, stopping at the floor. 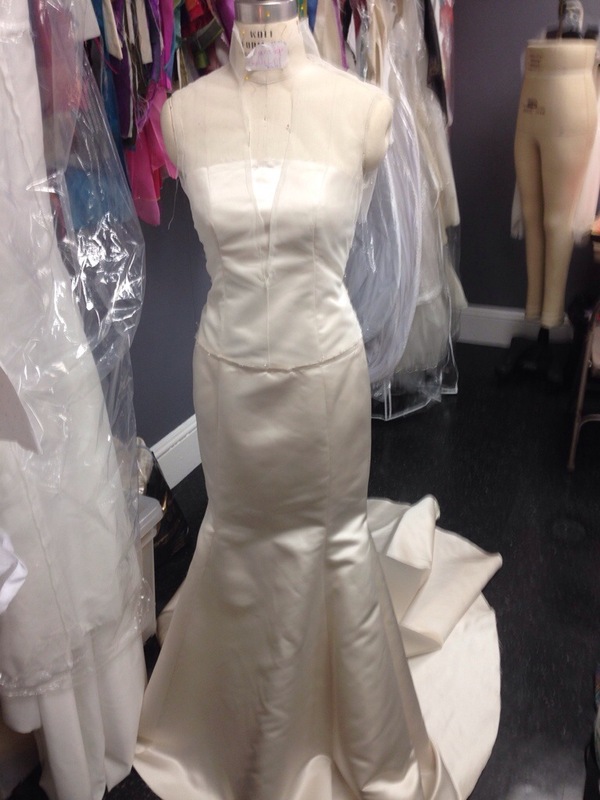 First: A thin layer of organza that will act as a buffer between the outer skirt and the next layer. 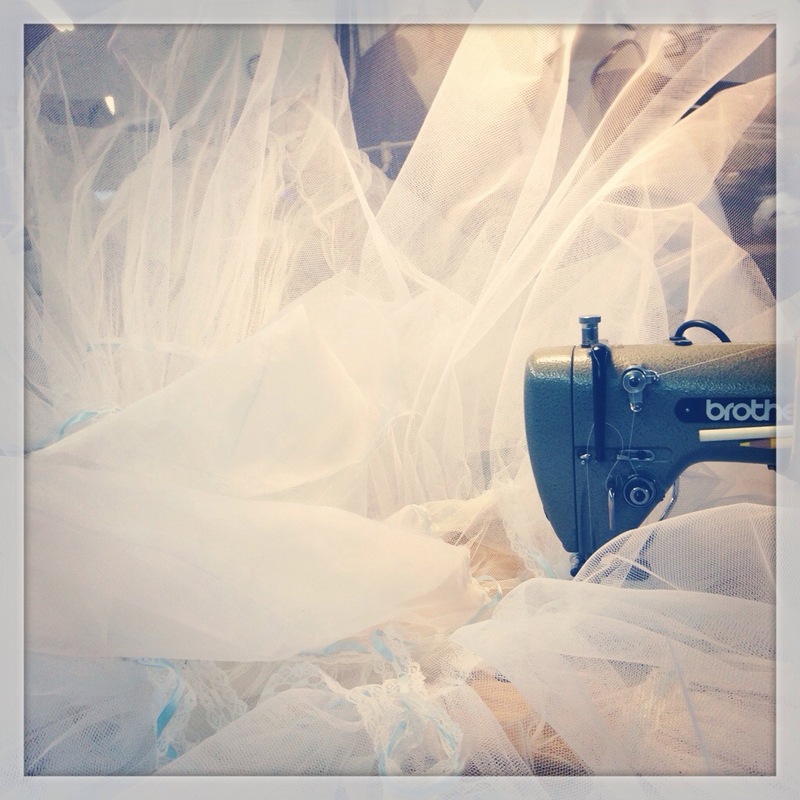 Next: a petticoat made of three layers of gathered diamond net. 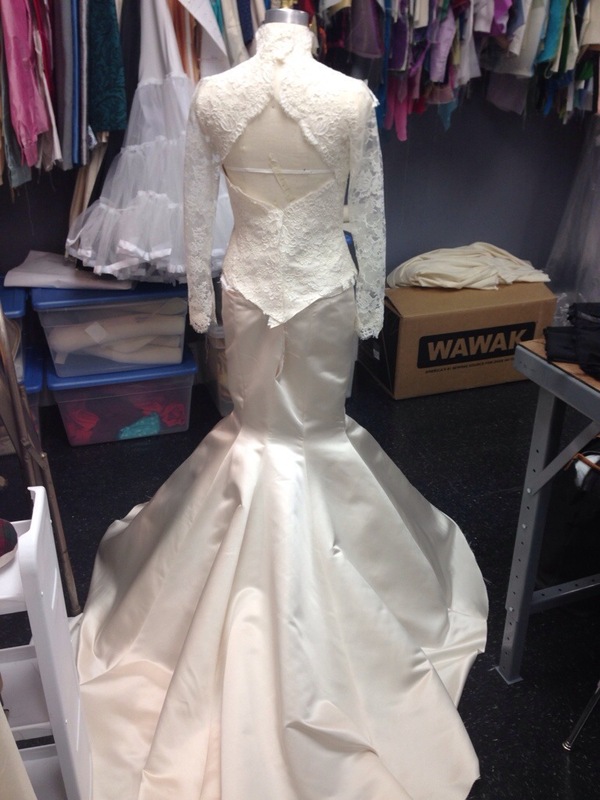 This layer gives the dress a bit more body and fills out the trumpeted bottom of the skirt. 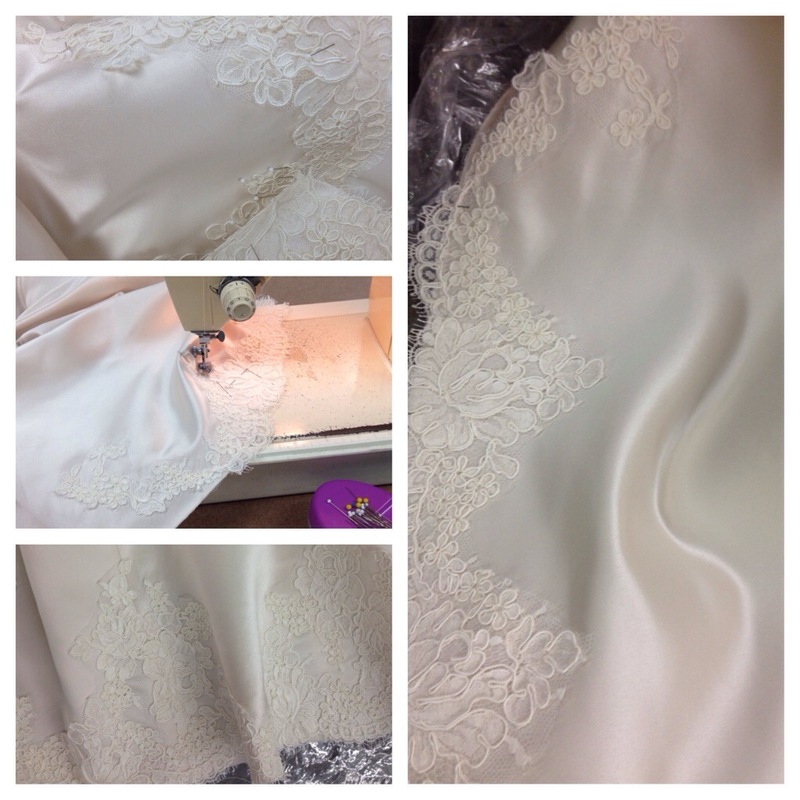 The final layer: Petticoat lining. This layer attached to the bodice lining. This layer drops in at the very end to clean finish the top edge of the dress, and is used to cleanly finish the center back opening. 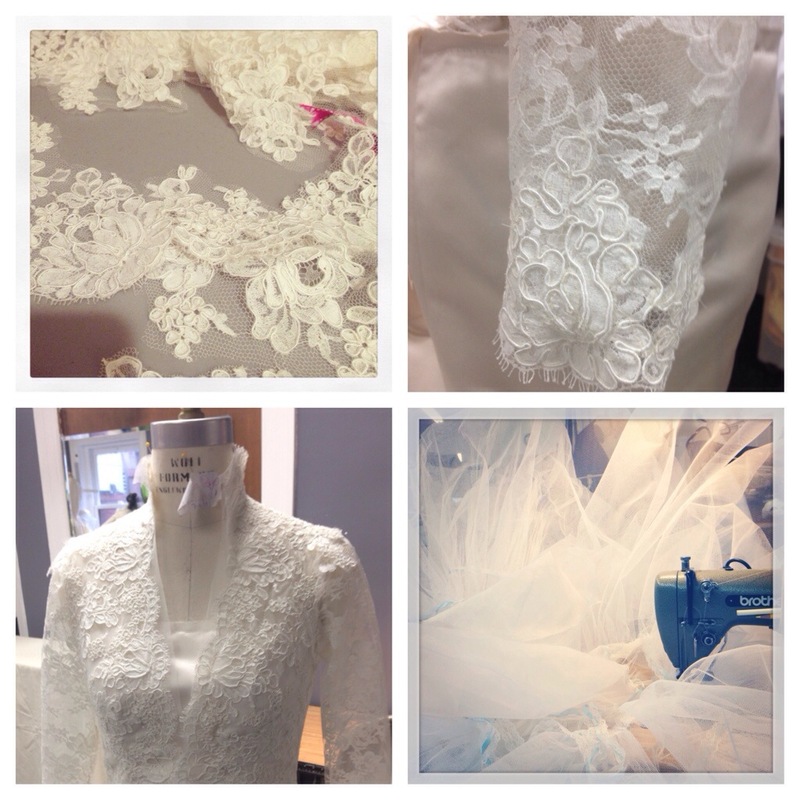 Then the lace comes on! Appliqued by an old 1950’s singer machine (that just does it better than anything else) and by hand. 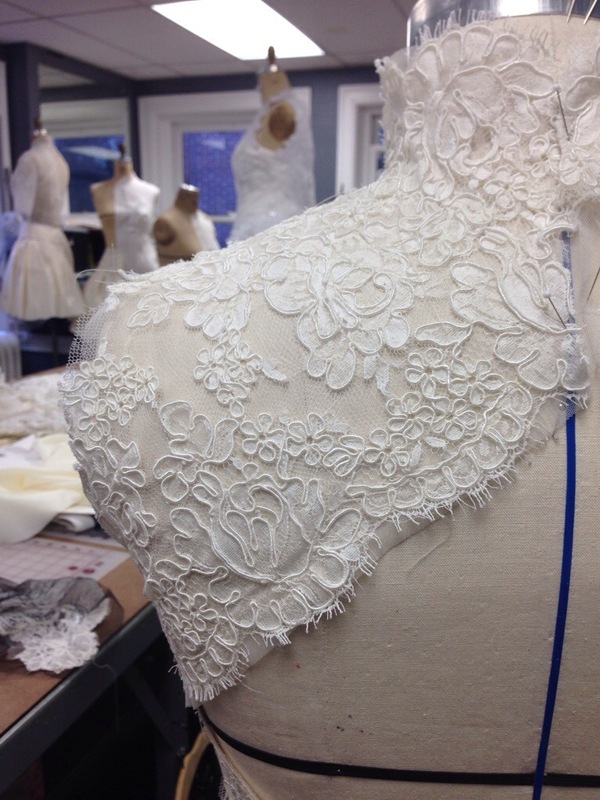 This beautiful Ivory Alencon lace gets figure molded over the ready made and fitted bodice. 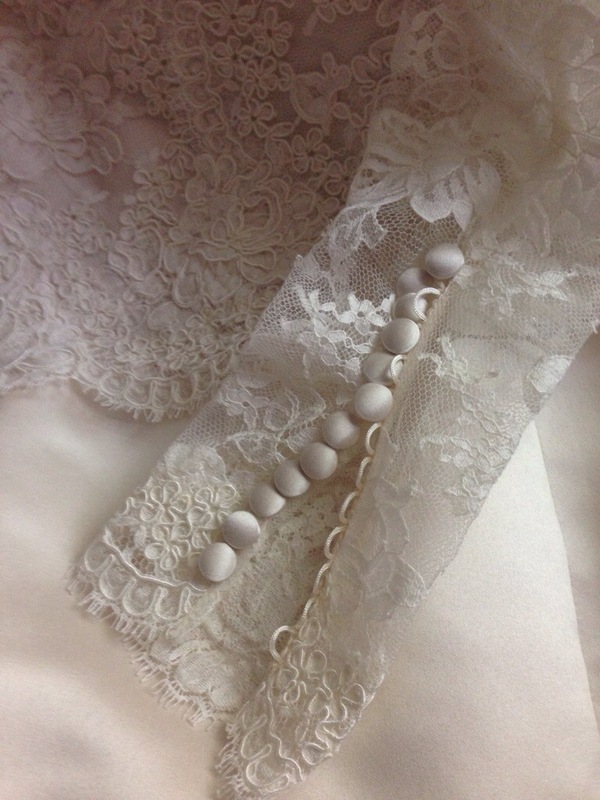 This particular lace is special because it is cordonnerie Alencon. 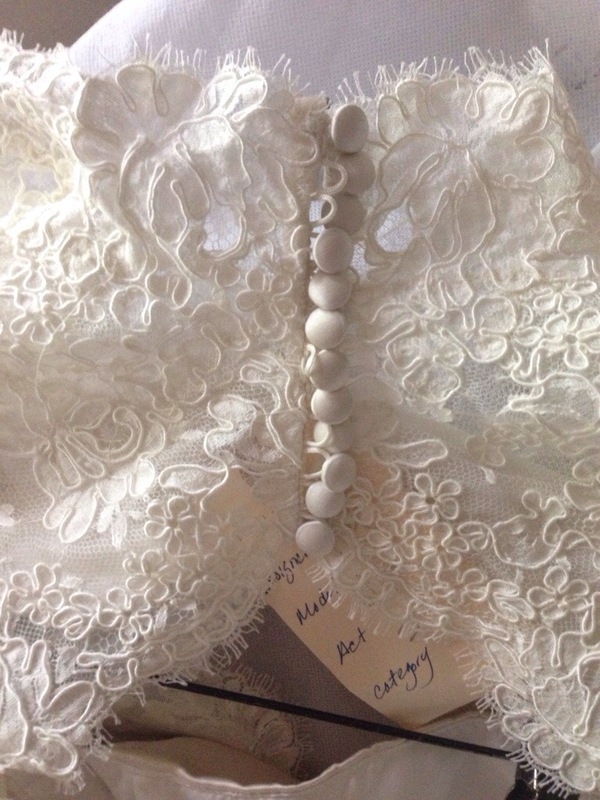 Basically what that means is that there is a thin cord that runs over the lace outlining each motif of the lace. 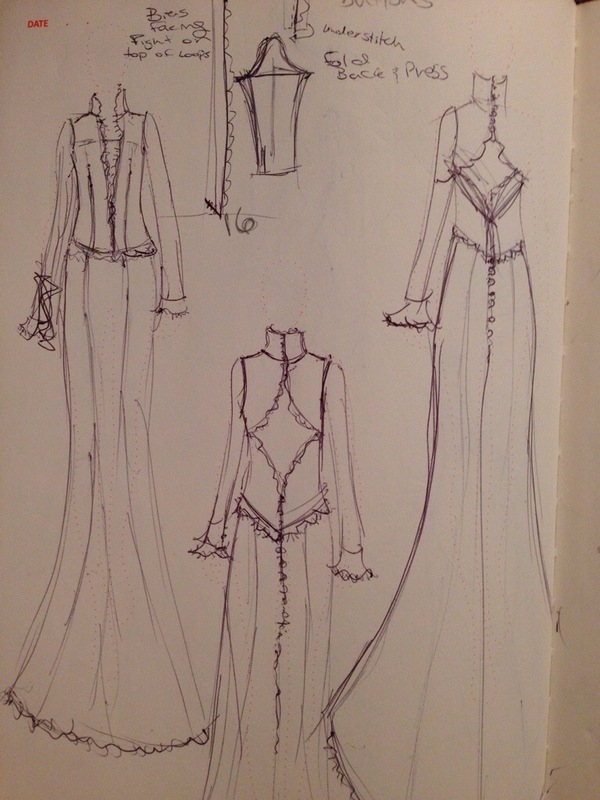 This, giving the lace extra dimension and subtle flair; aspects I always try to include in my designs. Now, getting to this stage is exciting because you really start to see you vision come to life…..
but you are only half way there! 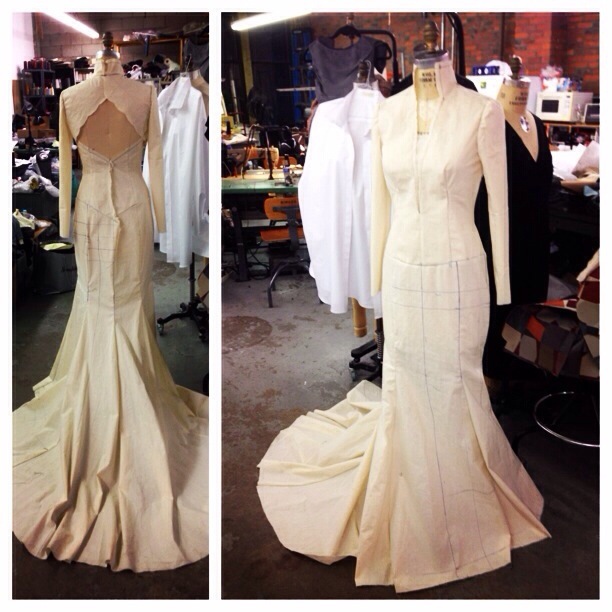 Like any couture garment, the most important part of the construction process is the finishing. 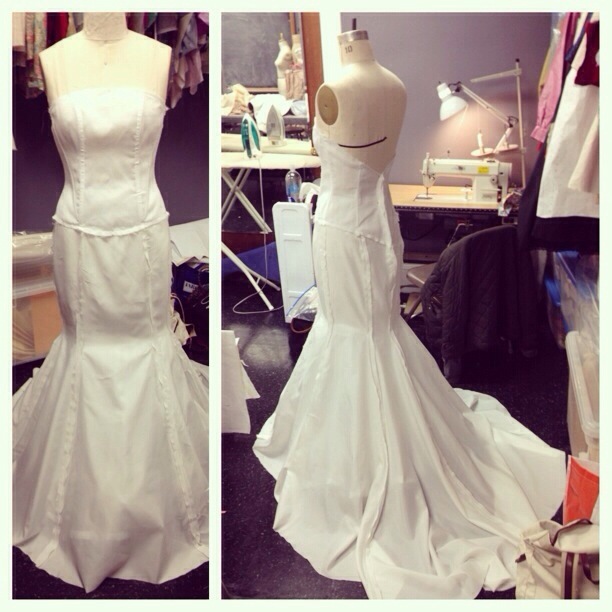 While this dress may look almost complete there is still about 5-10 hours of work left! Button loops must go in and then 72 custom cover buttons must be applied. Then its off to hair and make-up! That’s a lot of buttons! 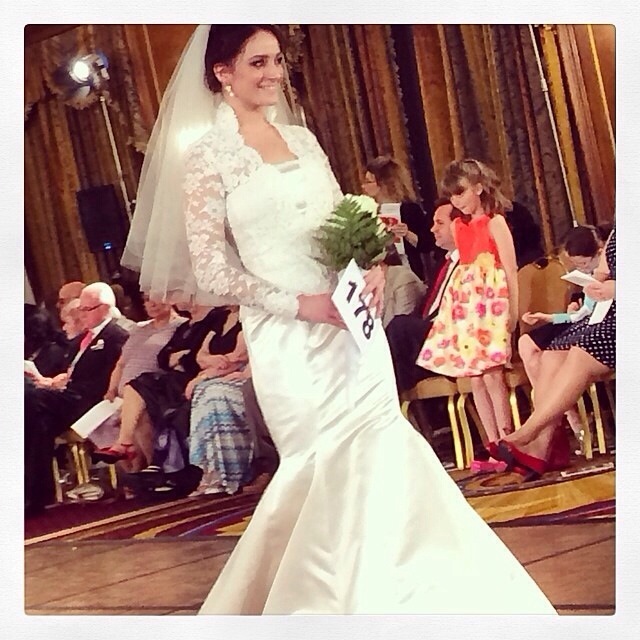 But a beautiful well made dress makes for a very happy bride! 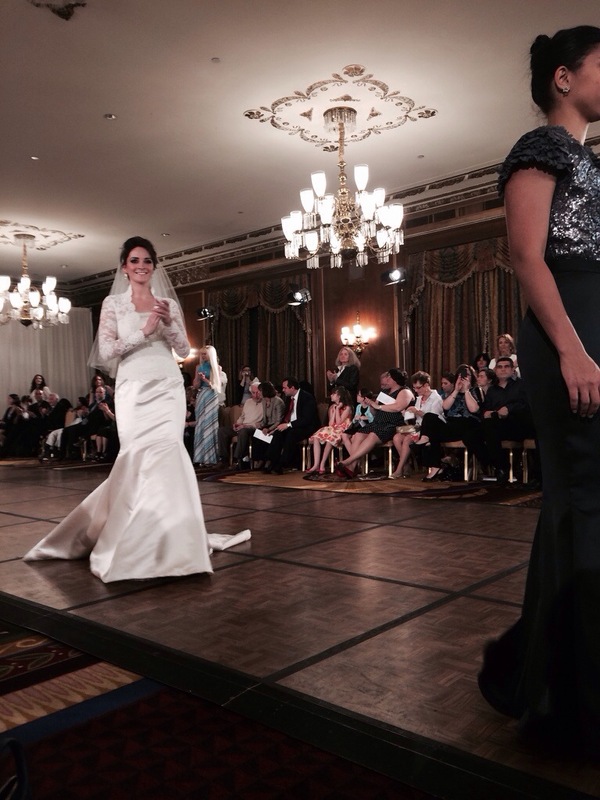 …or at least a happy model at the end of a fashion show! 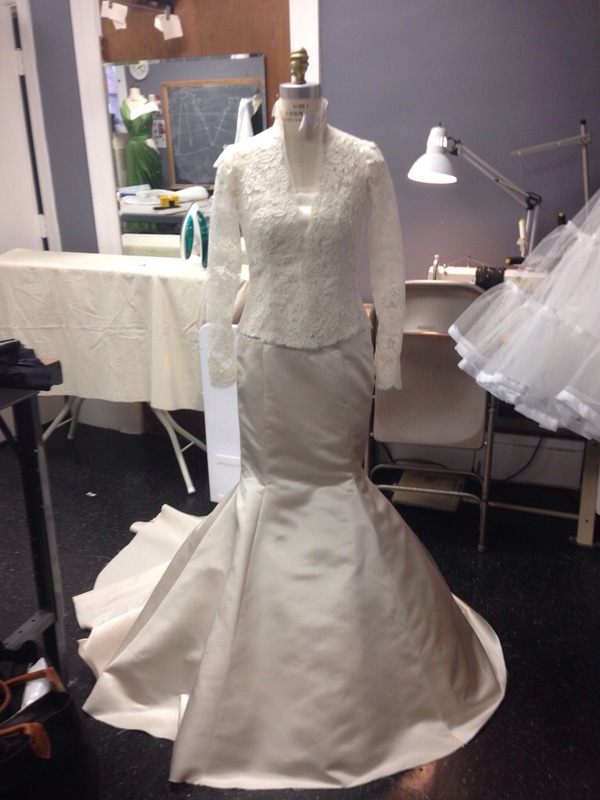 Many Thanks to Pierce Harman and Daniel Faucher Couture for helping make this dream a reality! As always, you never disappoint me with your innate sense of style………hope you and your family are doing well. Had a great visit to Boston for Easter. 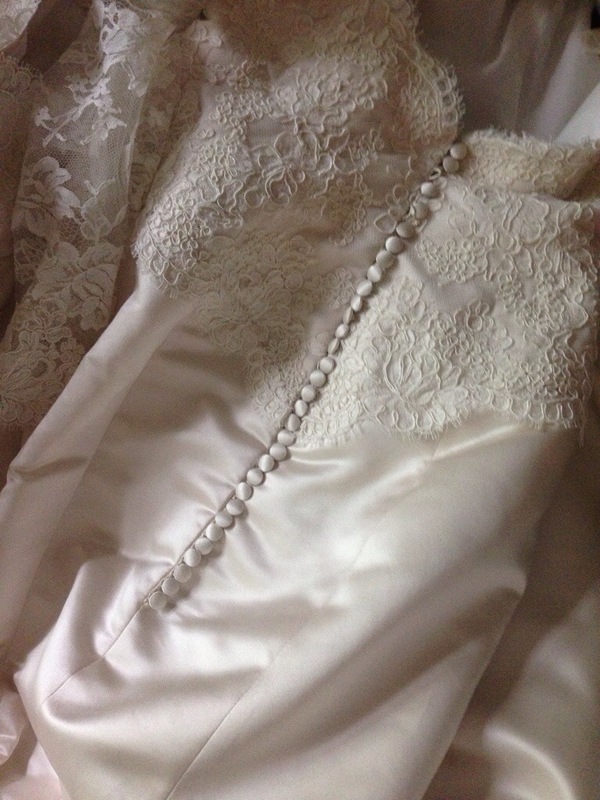 Our precious Olympia is a beauty and so sweet………..Connie Venechanos We love alencon lace ! !